When you get in the shower you expect to come out squeaky clean. What you don't expect -- or want -- is a foul smell emanating from your shower drain. Over time shower drains often start to harbor bacteria along the wall of the drainpipe. These bacteria make the drain pipe look shiny and slick, and they are also what creates the foul smell that may be coming from your drain. The good news is that these bacteria can be kept under control -- and the odor eliminated -- using common household products. Remove the drain cover in your shower. This generally involves removing two or more screws and then lifting the plastic or metal cover off the top of the drain pipe, but in some cases no screws are involved -- the cover simply lifts straight up. Wipe the cover with a cloth that has been dipped in household bleach. Wipe an old rag around the inside of the drainpipe. You may need a flashlight to help you see into the pipe, and you may need a wire coat hanger to help push the rag down and to pull it back up. Be careful not to get the rag stuck in the pipe. Only clean the top of the pipe if there is a chance the rag will become stuck if pushed farther down. Put the rag in a plastic bag, seal the bag and throw it away when you are done wiping the inside of the pipe. Boil 1 gallon of water and then pour the hot water down the shower drain. This will kill many of the bacteria. Pour 1 cup of baking soda into the drain and allow it to sit for 30 minutes. The baking soda will absorb many of the odors that remain. Pour 3 cups of vinegar into the drain. You will hear it fizz as the acid in the vinegar reacts with the baking soda. Stuff a rag into the opening of the shower drain to prevent the vinegar and baking soda from foaming up into the shower. Leave the vinegar and baking soda in the drain for a minimum of three hours. You may wish to leave it until your next shower. Shower as normal after the baking soda and vinegar have been in the drain for a minimum of three hours. 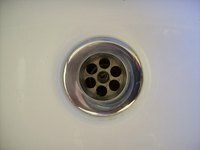 If the smell is gone, replace the shower drain cover and replace any screws. Pour 3 cups of household bleach down the drain if any smell remains after you have used the baking soda and vinegar and taken a shower. Allow the bleach to remain in the pipe for a minimum of three hours, and then run the shower to flush the pipe. Follow these steps once each month to prevent future odor problems. Do not breath the bleach fumes if bleach is used. Make certain the bathroom vent fan is running at all times. Do not get any bleach on your clothing when pouring it into the shower drain, as bleach will remove colors from fabrics. What Can Make Our Bathroom Drain Smell Better?